Do you ever wonder if your chickens are cold in the middle of the winter? I know I do! Here are some safe tips for keeping chickens in the winter that will help you and your chickens enjoy, or at least tolerate the season. If you have batch of chicks in a brooder when a cold snap hits – check on them frequently and if you see them all huddled together and peeping loudly, they are too cold.Lower your red heat light to increase the temperature of your brooder for your chicks or add another light. Put a cheap, non-digital thermometer down at their level to monitor the temperature, as you also don’t want them getting too hot. Young chicks should be kept at 95 degrees or a little better for their first week then the temperature can drop a couple of degrees each following week. In the winter a brooder should be in a draft free area and either up off of the cement floor or there should be adequate insulation between the chicks and the floor, like several fluffy inches of bedding. If there is a power outage it will be necessary to bring your chicks indoors and place them near your alternative heat source to keep them alive. Our alternative heat source is a wood stove, so using the cheap little thermometer we would find a suitable spot by the wood stove. Most adult chickens will do just fine in winter, even in cold climates. They may not enjoy it all the time, but they are very adept to it. Some breeds are more cold hardy than others – I make sure my flock is made up of mostly cold hardy dual purpose breeds because in our area it is not uncommon to see winter temperatures drop below zero. Cold hardy dual purpose breeds include Australorps (my favorite), Delawares, Orpingtons, Rhode Island Reds, Barred Rocks (Plymouth Rocks), Brahmas, Buckeyes, Jersey Giants, and Sussexs, just to name a few. These hardy breeds will get you through the winters with more than a couple of eggs too. Although you may need to add a light on atimer (like this one here) that is rated for outdoor use and is heavy-duty enough to handle the draw of a couple of lights at once. If winter egg production is your goal, it is important to do this BEFORE daylight hours start dropping. Hens prefer at least 14 hours of daylight to stay productive and if you let daylight hours drop before getting your light installed, her egg laying cycle will shut down or slow for winter, even if you later add a light. While I use a light for my hens, I know several friends who don’t use any light at all and they see only a slight drop in egg production. Many people are tempted to add a heater or leave a light on all day during the cold of winter thinking that their poor chickens are freezing out in the weather. Most experts strongly advice against this. The risk of fire is too great and chickens are far more resilient than most people think. Making a cautionary point, a regular 100-watt light bulb burns at 200º F; a heat lamp at 500 º F, wood ignites at 575º – 600º F, leaving very little margin for safe operation. The wood dust and their soft downy feathers that like to collect on the bulbs will ignite at an even lower temperature. A single, heat lamp (250w) running all the time will cost you something like $24+ per month on your electric bill. If you live in an area where a snow storm or ice storm could knock your service out for days, chickens used to a very warm coop could find themselves in real trouble. Even in normal winter temperatures it’s hard on your birds to go from the warm coop to outside and then back in. If you have chosen cold hardy breeds and your coop closes up – insulate the coop and close them up at night to keep the wind out, protecting them from the wind and humidity is your best defense against winter temperatures. Most cold hardy chickens will do just fine even when temperatures hover around zero and have been recorded doing just fine in even sub-zero temperatures. Chickens have 8,300 feathers and know how to arrange them just right so they stay warm. Sometimes chickens can develop frostbite on their feet and combs so its import to keep an eye on them during such temperatures. A little vaseline applied before dark can help prevent this if you feel like chicken wrangling. The Question of Vaseline or Oil – Does it Work? Vaseline does not keep parts of your chicken’s body warmer – but it does keep moisture from condensing and freezing directly on the surface of the comb or wattle which is usually the cause of frostbite on chickens since their appendages can in fact withstand subzero temperatures. Remember chickens are NOT mammalsand do not react the same to cold as mammals, they are far more resilient to cold. However, if it is cold enough that parts of the chicken are actually freezing, vaseline will not help. Installing wide perches will let the birds sit on their feet to keep them warm. I used 2x2s for my coop, closet dowels also work as do 2x4s. Occasionally Mother Nature will just have us out matched so in the case of an extreme life threatening cold snap, you may have to add an additional source of heat. In this case I would like to suggest a 60-100 watt light bulb or ceramic bulb and not an actual heat lamp bulb. This will be just enough to take the edge off of the cold, will be cheaper to operate, and will be less of a fire risk than a 250 watt heat bulb. Secure the light in two places so if one connection fails the other will catch it before it comes in contact with the chicken’s bedding, somewhere your chickens can’t mess with it. Chicken coop fires do happen and the likelihood of chickens surviving even a small coop fire is slim (news story – coop fire kills chickens and destroys garage). When the cold snap is over remove the light from your coop. If a cold snap of this severity were to happen in conjunction with a long-term power outage it may be necessary to move your chickens to a warmer location, perhaps in your garage, basement or even in the house with you. Dog crates are handy for impromptu moving of chickens – bring them in warm them up, then pack them easily back outside when the weather is safe. When you close your coop up in the evenings make sure to maintain adequate ventilation, otherwise moisture will collect inside leading to frost-bitten feet and combs. Vents placed high on the coop wall are excellent for this purpose. This is also why it is important to keep your chicken litter clean and dry. While a deep litter system will also insulate your coop from the cold it’s important to remove wet spots as soon as possible to avoid an accumulation of moisture. Your chickens will huddle together and stay quite warm all night, I have heard that one chicken puts out something like 10 watts of heat, so if you have 10 chickens huddled together in your coop, it’s the equivalent of running a 100 watt light bulb in there all night. As long as it isn’t humid or damp in there you most likely will not see frostbite. One of the things I use to guard against moisture is wood pellets (the plain ones they sell for wood stoves), they will dutifully absorb any extra moisture expanding into saw dust as they do so. 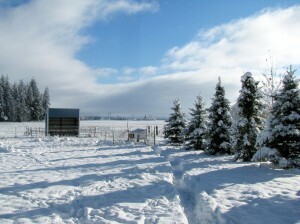 A key issue for chickens or any poultry in the winter is a supply of fresh water, so if you don’t like hauling water to your chickens twice a day because it continues to freeze solid, construct your own chicken waterer that uses asubmersible aquarium heater or invest in one of the store-bought waterers with a built-in heater. Another alternative is one of the old fashioned base heaters, you sit your metal poultry waterer on these as it heats from below controlled by an internal thermostat. In sever cold temperatures chickens should never go more than a couple of hours without fresh water. When you open your coop up in the morning to give them the option of going outside, keep in mind most chickens do not enjoy the snow so they probably won’t venture out of the coop much if the snow is deep or if the temperature drops below 20 degrees. This is why I shovel the snow out of my chicken pen in the winter – to encourage them to go outside and get a little fresh air. If they are getting a little restless in their coop and still don’t want to go outside you can hang a half a head of cabbage from the top of the coop and let them spend all day shredding it, it will keep them busy and it’s a good treat for them too. What I also make a point of doing is storing at least a winter’s worth of feed for my chickens. This way if anything happens and I can’t make it to the store my chickens will not go hungry. I maintain that supply at all times, using the oldest food first and buying more or growing more to replace what I have used, nothing goes bad and it doesn’t take up much space to store. I also use food to help warm my chicken up, occasionally on real cold mornings I will make them up some warm oatmeal for breakfast, any oatmeal will do, and they’ll love the snack. Another thing that anyone can do to help keep their chickens warm is feed them a little bit of corn scratch in the evening – this will help keep them warm all night long. Chicken feed with higher protein levels will also help keep them running warmer. PLEASE NOTE: Scratch grains should not comprise more than 10% of your chickens diet. Scratch feeds, (usually cracked, rolled, or whole grains such as corn, barley, oats, or wheat), are relatively low in protein and do not provide balanced nutrition. In fact, if too much scratch is added to an already complete diet, nutrient levels can be diluted. Therefore, it is recommended that scratch be fed sparingly (info source 1) (info source 2). Keeping chickens through the winter is not a hard thing to do with the right information. I hope this article helps and if you have any tips or advice please leave a comment below to help others. Previous: Previous post: The Herbal Prepper & The Herbal Medic! Next: Next post: Preparedness Skills!